Size: Leanchoilia is 3.2 inches long! 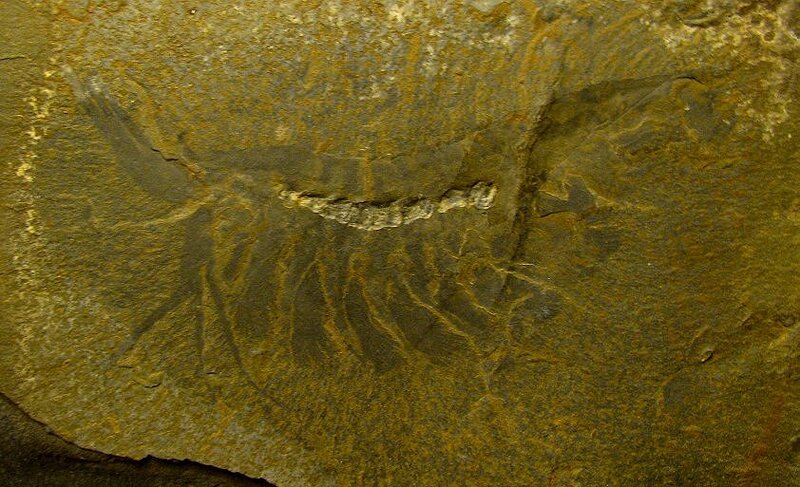 This is an extremely rare arthropod fossil. It is a large Leanchoilia superlata from the famous Burgess Shale locality. This specimen is from an OLD collection, and was found DECADES ago. Leanchoilia is a four-eyed arachnomorph arthropod known from the Cambrian, mainly found in the Burgess Shale of Canada This arthropod had long, whip-like feelers mounted on frontal arm-like appendages - this feature is well displayed on this specimen. In fact, this animal was fossilized with one appendage angled up, and one pointing downward! This arthropod has very good detail preserved (MUCH better than the photo shows) - the gills are even well showcased. The overall body shape is intact, and the distinct gut is very easily seen. And at over three inches long, it is a huge fossil animal from the Burgess. 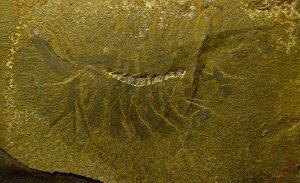 This is a very collectible specimen for someone who wants a rare arthropod fossil from the classic Burgess Shale.